INPUT adds market insight and opportunity information to the customer base. 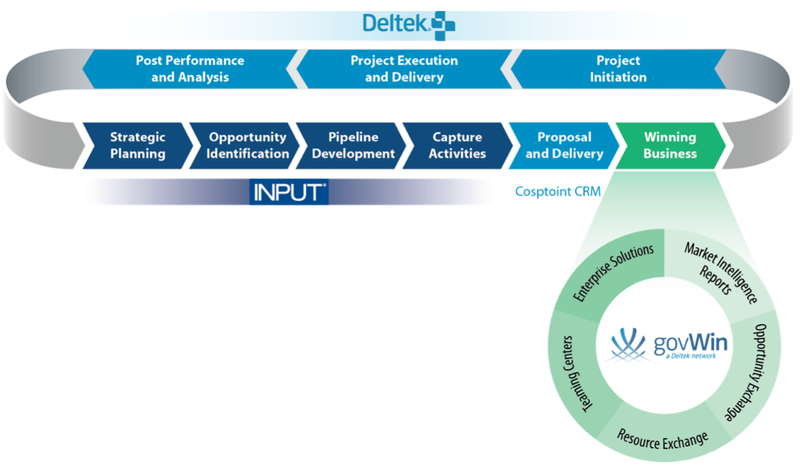 INPUT’s solution delivers opportunity information and identification, pipeline development, and capture and proposal management across the public sector market place (see Figure 1). INPUT’s teaming capabilities, greater reach and membership, and centralized market intelligence matched to opportunities will enhance today’s existing GovWin capabilities (see Figure 1). Point of View (POV): INPUT provides the information, analysis, opportunity identification, and community stewardship for the government contracting industry. Deltek gains a key asset that allows government agencies to find potential contractors. Private sector contractors add the ability to find teaming partners, track competition, and manage the contracting sales pipeline. The merger expands the reach of GovWin and adds much needed lead information to Deltek’s project initiation, project execution and delivery, and financial management capabilities. Long term value resides in the business development network. The combined INPUT and Deltek govWin networks will create a $500B marketplace for government agencies and private sector contractors. INPUT serves 2,000 member companies across 48,000 individual members for both government agencies as well as the private sector contractors. For offering tracks more than $3 trillion in federal opportunities and $50 billion in state and local opportunities. The solution also capture 3.2 million labor rates from over 61 vendors. POV: Deltek’s move enables the software company to move up the value chain and into the information brokerage business. Software Insider believes that next generation software companies will transform into information brokers. Data and community will become more valuable than the software. Three areas of growth will include benchmarking, trending, and prediction. INPUT provides the content for analysis and research services needed to drive community engagement and deal flow. INPUT gives both buyers and sellers a strong base of tools to reduce the friction of procurement and improve deal transparency. Deltek and its customers gain access to a community of 4000 unique government contracting organizations and 90 of the top 100 Federal contractors. The result – a hard to beat one-stop shop. Looking to understand the Project Based Solutions market?